Pluto would be a great family dog. Photo credit: FurKids 911. 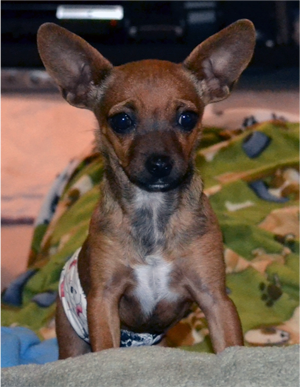 Pluto is an 8-month old tiny Chihuahua boy. He was transferred to Seattle from a high-kill shelter in California and just arrived in our rescue. Pluto is a timid little guy but once he is in your arms he is a lover. He loves to play with balls or chew toys. He is crate trained and almost potty trained. He is trained to use pee pads and does have some marking issues but that can be easily corrected over time with a good potty schedule. Pluto gets along with other dogs but can be a little aggressive at first. He would be a great family dog. How can anyone resist that adorable face with satellite ears. Pluto's adoption fee is $280. He is neutered, vaccinated including rabies, heartworm test negative, flea medicated, dewormed, and microchipped..
We are an all-volunteer group with regular full-time jobs. Our rescue work is done on our own time, mainly in the evenings. Email is the best form of communication and we ask for your patience due to our regular work priorities. Our email is info@furkidz911.org. Thank you.